Thank you to everyone who left a kind comment, said some prayers or texted, called, emailed or messaged me over the last week and a half while Baby Boy was in hospital. An extra special thank you to those who visited us. We are home now to enjoy Christmas. One of the gaps I noticed in my wardrobe when spring arrived was some nice relaxed fit block colour tanks. I was thrilled to find this metallic one at Jeanswest. I had a gift card and it was on sale! It's a very pale green with silver thread running through it, and they have it in brown and gold too. It's on sale again, with 40% off. Since the festive season is the perfect time to wear something that sparkles I've included a few more sparkly pieces for you to shop below. Ideal for New Year's Eve party outfits! Wore this for a busy morning. We haven't been house hunting much since having Baby Boy, only because it's so much more difficult touring open houses with two little ones. We're really picky with what we want to see. Two possible houses popped up in our searches so we decided to go visit them both, and finish a little more Christmas shopping. Although neither house made us feel like it was the perfect house for us it was nice getting out and looking at houses, it seems to have been a while since we saw any that looked promising. I was happy to wear my new tank too. I added some colour with the accessories as it seemed like a pretty plain outfit otherwise. 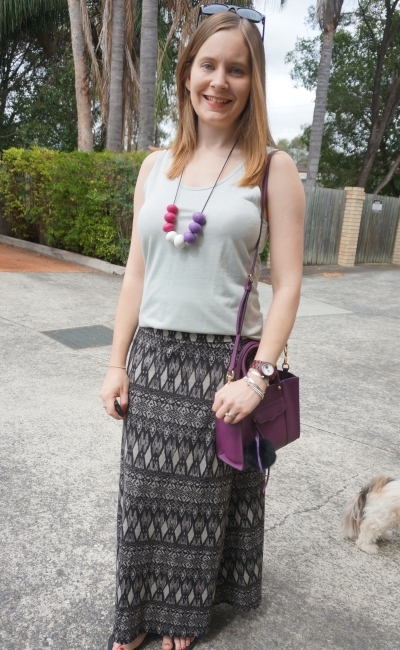 Last worn: Ray-Ban Wayfarer, printed maxi skirt, Havaianas, purple mini MAB tote bag. First time I've worn the top as it's a new purchase. 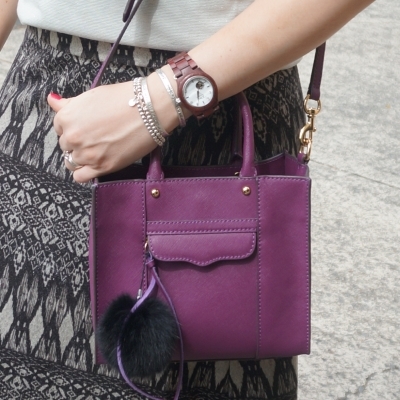 Other ways to wear: printed maxi skirt in winter, purple mini MAB tote bag and winter layers. I liked the plain tank and printed bottom combo above so wore it again the second time I wore this metallic tank top. Although this time with shorts instead of a max skirt. Again I wore this to do a little bit of Christmas shopping! A little bit of sparkle with the metallic thread does seem so festive for December. It's been a year and a half since I last wore these shorts, which is a crazy amount of time. I was pregnant last spring/summer though so that's partly why these shorts were unworn. It was so good to get them out again, a nice change from the usual denim shorts I tend to default to in the warmer months. I really like this tank, definitely a keeper. The subtle metallic thread and shimmer makes it a great basic piece that I'll be wearing even after the festive season. It fits my wardrobe wishlist need for more basic relaxed fit tanks and I'm really pleased I bought it. Last worn: Ray-Ban Wayfarer (above), metallic tank (above), printed shorts, studded sandals, silver mini MAC bag. Other ways to wear: printed shorts and purple top, studded sandals and denim shorts, metallic silver mini MAC and stripes. Linking up with Fresh Fashion, What I Wore, Midweek Inspo, Oh Hey Girl, Fab Favourites, Passion for Fashion, Fun Fashion, Fabulous Friday. Perth is much hotter than Brisbane! Great looks! I'm loving the patterened bottoms with that tank! You can say that again. It's the season of sparkles and lights. To be able to wearing a piece in more than one way is a beautiful things. Sweet! Glad that you're home for Christmas! I totally get the stall in house hunting. I think it's great you know exactly what you want and the perfect house just hasn't come on the market yet. (; We took Pen to see three houses with us, including the one we bought, and she was a nightmare! lol So I sympathize with you! Oh glad you only had to tour 3 with her, it is so difficult with a little one! Love those shorts! Yay for breaking them out again, such a cute print! What a lovely bit of sparkle for the season! So happy to read that your baby is back home !!! The metallic thread tee is a hit - I like it, specially worn with the silver bag. I think they are just Australian? But I do go on about them a bit, definitely my favourite store! So glad things are on the up with baby boy :) I hope you have a wonderful Christmas all together. Glad to hear you are all home for christmas! And good luck with the house hunt, I hope the perfect one comes up soon! Oh my goodness I didn't know that your sweet boy was in the hospital! I'm so sorry to hear that and I'm glad to hear that you're home now. I am sending so many thoughts and prayers your way Mica! How scary. I can't believe you manage to keep up with blogging--you are super mom for sure! Take care friend! I was lucky to have all my scheduled posts so things could go live as per the usual schedule. I love owning a good little metallic tank! You can style it so many ways. I love the two looks you've done here Mica. I'm so glad he is well! I agree the metallic tank was an awesome purchase! It's definitely a season to season cute wardrobe item! I pray you have a blessed Christmas! Glad to here you guys are home! Hope life is getting back to normal for you all. Love the silver mini Mac bag, and adore the necklace and skirt. Great details and outfit inspiration ! Glad to know Baby Boy is well at home now. Best of luck with the house hunting. May 2017 bring you guys your dream home! I hope your little boy is doing well, so sorry to hear he was unwell, Hope you have a great christmas, I love your top, the sparkly thread running through it makes kt extra special. I am so pleased to hear that your little boy is better and at home again. I hope that you all have a very Happy Christmas! And everyone was trying so hard to get us home for Christmas so we wouldn't have to be in the hospital, it was lovely to see. You're making me crave a little bit of summer, Dear! Happiest of holidays to you and yours and thanks so much for sharing with Fun Fashion Friday! Thank you all for your kind words - it was wonderful having baby boy home for his first Christmas and I hope you all had a very merry one too.